TeleAttend- Advanced Telephone Clocking Time And Attendance Systems. TeleAttend is a fully automatic telephone clocking solution that enables organisations to accurately capture and record workforce activity, by landline telephone, from any large dispersed or remote workforce, 24 hours a day, and without manual intervention. TeleAttend is the quick and effective way to capture attendance information, monitor health and safety, and facilitate business security - through tracking both employees and your service delivery. TeleAttend is ideal for businesses with mobile employees, such as those attending remote job sites, for example; cleaning services or home healthcare businesses. Our service caters to thousands of businesses large and small. 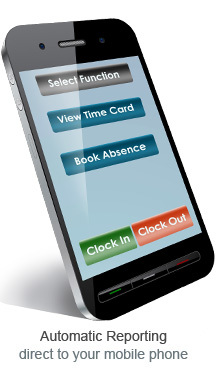 Telephone Time & Attendance - Track your employees remotely. Utilising VOIP, GSM, Mobile Data and ISDN technology, TeleAttend enables maximum efficiency when managing a large workforce, capturing information from the remotest of sites - and automatically routing data to our Time and Attendance software product - Timestandard - for intelligent data handling and a comprehensive suite of workforce management tools. This gives your organisation the immediate benefit of tracking your workforce activities through an intuitive, easy-to-use application. Employees simply dial TeleAttend’s telephone number from a land line to connect to the service. Their activity is logged automatically with TeleAttend- and is then routed to Timestandard. Also messages can be routed to you, in voice or text format. This enables Managers to check their employees’ activity in real time. TeleAttend is easy to use, with no set up necessary – we do all this for you! So you can be up and running in no time and providing management with the powerful tools to monitor and improve workflow. No additional hardware required- none to install, configure or maintain – we do all that for you. Fully redundant solution- hosted by TeleAttend and no software installation required! No telephone lines required- saves on cost of dedicated phone lines or company mobiles each month and the cost of replacing costly servers. TeleAttend also supports and integrates with a variety of optional data collection devices - such as Mobile phone, Web clocking, Biometric terminals, RFID terminals, Hand scan terminals, Swipe card readers- collect your information in the most efficient ways at your sites!